Habitat: deep forest, desert cliffs, and woodland lots to suburban estates, parks, and cemeteries. They roost in dense foliage, tree holes, old nest, and cliffs ledges. 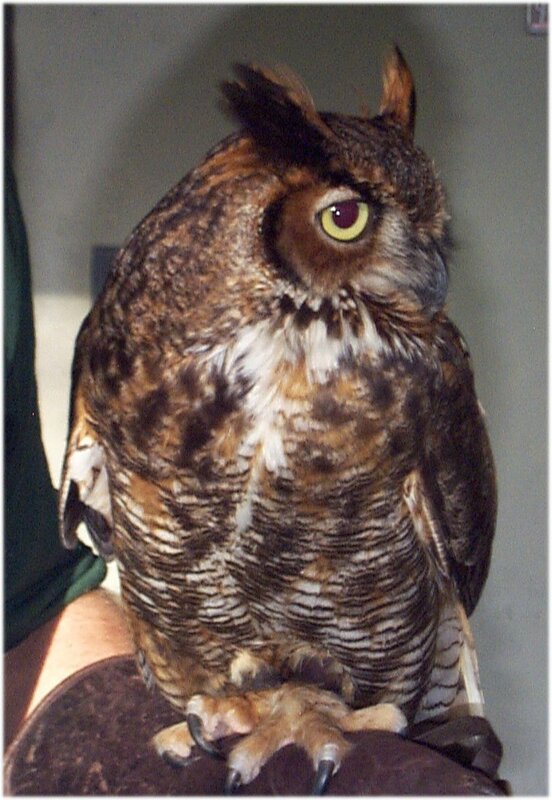 Great Horned Owls range from 18-25 inches in height. They have a wing span of 35-55 inches. Females are usually larger than males. 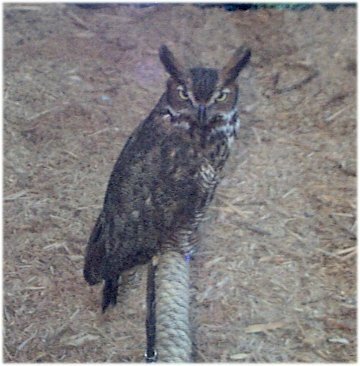 They are the heaviest and most powerful American owl, and second in size only to the rare Great Grey Owl. 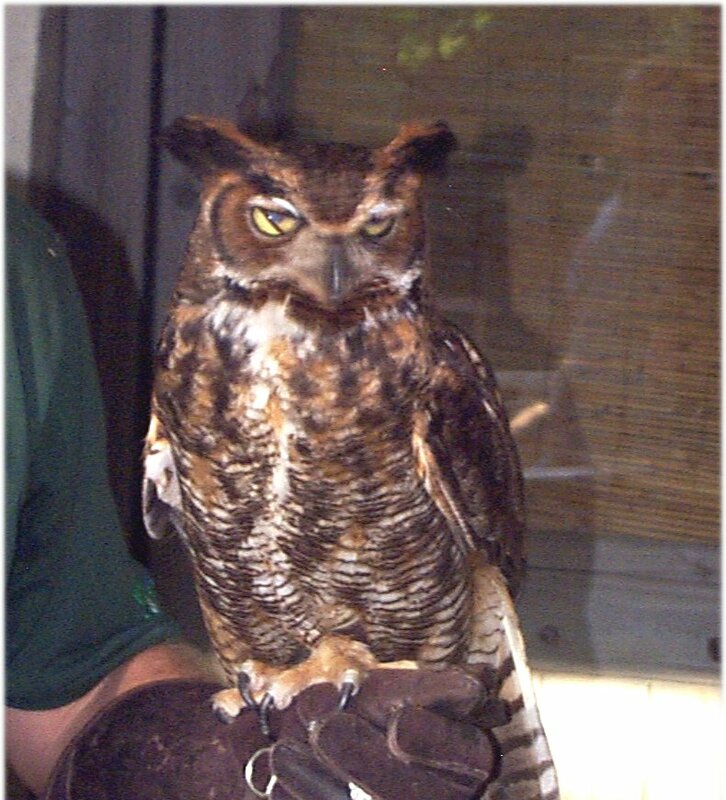 Great Horned Owls are very large and bulky birds with prominent, widely spaced ear tufts. They have large bright yellow eyes, and a bold white throat bib. The color of these birds varies with the area they are found in. 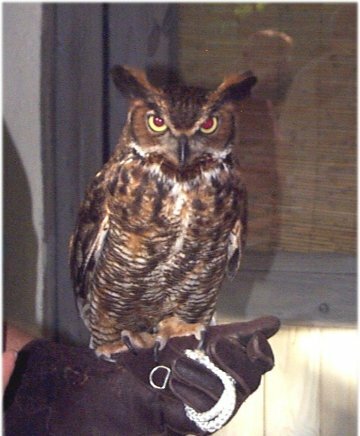 Pacific Northwest and Canadian Great Horned Owls are very dark, but the desert region birds are usually very sandy in color. Arctic Great Horned Owls on the other hand are almost white. A similar species is known as the Long-eared Owl. It is smaller and slimmer, with ear tufts set closer together. They lack the white throat. General information: Great Horned Owls do not build nests, but they will use the old nests of hawks, herons, eagles, and crows. They mostly use nests that were used by the red tailed hawk and regularly take over active nest of these species. Owlets have been known to be raised in the corner of an active bald eagles nest. There are usually 2-3 eggs laid from early January to February. After hatching the young owls often spend 10 days to 2 weeks on the nest protected by their parents until they are capable of fight. The sound of the hoot of the male owl is deep while the sound of the female is at a higher pitch. The males usually give four to five hoots; females(lower in pitch) six to eight hoots. Great Horned Owls prefers to sit in a tall post or tree at the edge of a field or forest to listen and watch for their prey. They also can fly through the forest or field like a whispering wind. 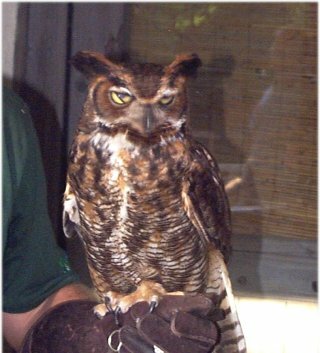 The Great Horned Owl is rarely on display at the Fort Worth Zoo. The owls seem to spend most of their time sleeping , but when they do come out they will just look at you. Its like a starring game and they win every time.